The versatility of Plant Pro means you can use it mixed with other foods, incorporated into recipes or on its own as a shake; it tastes great used in smoothies. Recommended maximum intake is up to three servings per day. Pea Protein Isolate, Whole Grain Brown Rice Protein, Natural Flavours, Chicory Root Fibre, Thickener (Xanthan Gum), Natural Sweetener (Steviol Glycosides). Pea Protein Isolate, Whole Grain Brown Rice Protein, Cacao (4%), Natural Flavour, Cocoa (1.5%), Thickener (Xanthan Gum), Natural Sweetener (Steviol Glycosides). 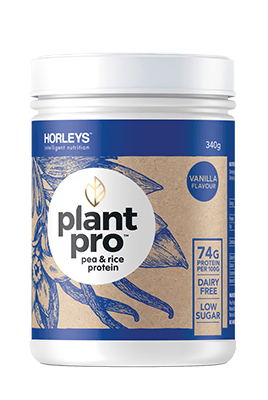 Horleys sources our vegan protein from a combination of pea and rice to ensure a naturally complete protein, with all nine essential amino acids. BEST FOR: weight management and satiety, increasing protein intake on a plant-based diet, and supporting exercise and muscle recovery. All-natural, dairy-free plant-based protein with complete amino acid profile to support wholesome nutrition. With a ‘not overly sweet’ taste profile it’s versatile enough to use in a range of recipes, so you can boost your protein intake at any time of day. SIZES: Plant Pro is available in a 340g (17 serve) tub. 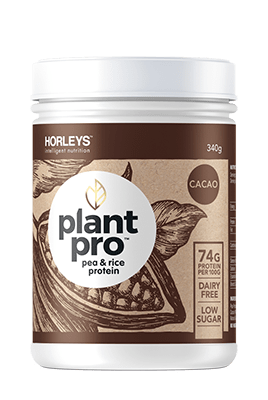 I have a dairy protein allergy – are there any Horleys products suitable for me? Choose PlantPro, a dairy-free (vegan) protein that is a blend of pea and rice proteins. It’s been formulated to be naturally complete so contains all nine essential amino acids, including the BCAAs needed for muscle repair and growth.